Sebastian Vettel won the 2013 Japanese Grand Prix at Suzuka today. 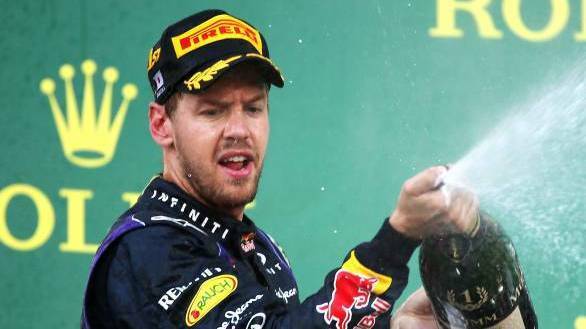 Of course, the win at Suzuka wasn't just about adding another trophy to Vettel's already large collection of silver. Instead it was about the German wunderkind homing in on his fourth title. Yes, first place at Suzuka has ensured that now Vettel only needs to finish fifth at the Indian Grand Prix in order for the title to be decided in his favour. It will make it Seb's fourth title on the trot. When the five red lights went out at Suzuka, though, the two Red Bulls didn't have all too great a start. Mark Webber and Seb Vettel, who occupied the front row of the grid, saw themselves overtaken by a quick starting Romain Grosjean. Grosjean kept his nose clean, got his Lotus to the front of the grid and set off in pursuit of what he hoped would be his first Formula 1 victory. And while he did manage to hold Mark Webber off for the most part of the race, the top step of the podium was out of reach. Behind him Webber followed in second, while Seb Vettel was down in third, after contact with Lewis Hamilton's Mercedes. The flat tyre and the resultant damage to the floorboard of the car that it resulted in, eventually led to Hamilton's retirement from the race. As it so often happens when it comes to Sebastian Vettel, counting him out of the hunt for victory, was really not an option. Vettel dove past Grosjean at Casio Triangle. And try as Grosjean did, keeping up with the Red Bull ahead of him wasn't possible. Mark Webber eventually made his way past Grosjean too, and thus the podium was decided - Seb Vettel on the top step, with Webber second and Grosjean third. Fernando Alonso and Kimi Raikkonen finished the race in fourth and fifth, with Nico Hulkenberg driving to a well-deserved sixth place. But it was seventh placed Esteban Gutierrez who was a crowd favourite at Suzuka, taking his first points of the 2013 season with seventh place. All in a good result for the Sauber Ferrari team. Nico Rosberg and Jenson Button rounded up the top 10.